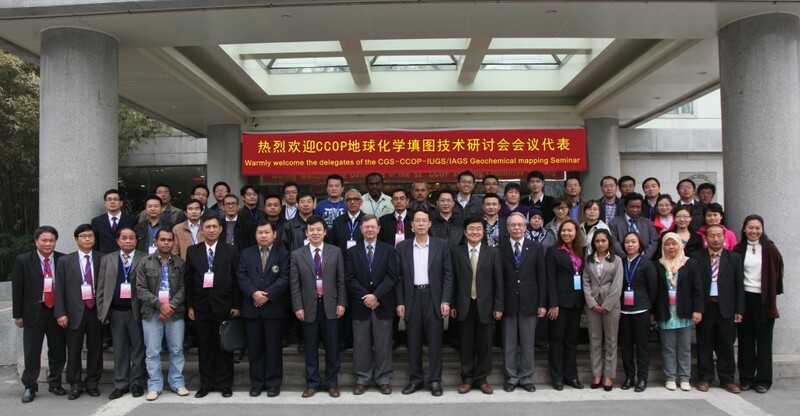 The Task Group (now Commission) was co-sponsor to the Seminar on CCOP Geochemical Mapping held at the International Conference Hotel in Nanjing, China, 28-29 March 2012. Other sponsors were the China Geological Survey [http://old.cgs.gov.cn/] and the Coordinating Committee for Geoscience Programmes in East and Southeast Asia [CCOP - http://www.ccop.or.th/]. The seminar was organised by the Institute of Geophysical and Geochemical Exploration (CAGS) of China Geological Survey. The seminar was attended by 100 participants from 13 CCOP countries (Cambodia, China, Indonesia, Japan, Korea, Lao PDR, Malaysia, Papua New Guinea, Philippeans, Singapore, Thailand, Timor-Leste, and Vietnam), Mongolia, Myanmar, and Brunei. Lecturers included Dr. Wang Xueqiu (2nd Co-chair of the Task Group), Dr. David B. Smith (1st Co-chair of the Task Group) and EurGeol. Alecos Demetriades (Chair of Sampling Committee and Treasurer). On the occasion of the 35th International Geological Congress and in conjunction with the 3rd Arthur Darnley Symposium the Task Group (now Commission) organised a two-day Workshop (WK4) on Global-scale Geochemical Mapping, Saturday & Sunday, 27-28 August 2016, Cape Town, South Africa. The first day, 27 August 2016, was devoted to lectures, where the nineteen attendees were given a comprehensive overview of the methods, tools and techniques used in global geochemical baseline mapping, and the training-material was provided to all attendees. Demetriades, A., 2016. Introduction to Applied Geochemistry. Wang, X., 2016. Geochemical mapping: Principles and methodologies. Wang, X., 2016. China Geochemical Baselines: Quantifying environmental changes. Demetriades, A., 2016. Sampling at the continental scale. Demetriades, A., 2016. FOREGS laboratory scheme. Demetriades, A., 2016. FOREGS quality control scheme. Wang, X., 2016. Regional geochemical mapping for mineral resources: Examples from China. Demetriades, A., 2016. Geochemical data management and map generation. Demetriades, A., 2016. Application of geochemical mapping for mineral exploration and environmental assessment. Demetriades, A., 2016. Application of geochemical mapping for environmental assessment. The second day, 28 August 2017, was devoted to the demonstration of sampling techniques used in global-scale geochemical mapping that are described in the FOREGS/EuroGeoSurveys ‘Geochemical Mapping Field Manual’ (Salminen & Tarvainen et al., 1998), which is available from URL: http://tupa.gtk.fi/julkaisu/opas/op_047.pdf. Suitable sampling sites for sampling floodplain, overbank and stream sediments, and residual soil were found in the Cape Farms area to the north of Cape Town.